The definition of "simple design" varies from person to person. But achieving simplicity isn't just about maintaining simple point solutions. The more complicated the system to test, the bigger the headache. Chris Meisenzahl takes a look at how you can take the pain out of testing complicated software systems with VMware’s virtualization tools—VMware Player, VMware Workstation, VMware Server, and VMware ESX Server. It's a fact of life that plans change, but the proper implementation of agile and release planning can get you back on track. Just be sure to keep the communication lines open and clear throughout the process. Stacia Broderick tells the tale of a department as it works out its kinks in the best interest of its customers. With Apple's conversion to Windows-capable, Intel-based architecture as his jumping off point, Tod Golding takes a look at how we tend to view new technologies through our old perceptions. As technology evolves for the better, he explains, we too must grow out of old rhetoric. An old adage says that you cannot manage what you cannot measure, but Mike Cohn thinks differently. Here, he offers suggestions on when to use metrics and when you can manage without, as well as some guidelines to help you choose your metrics carefully. From providing the likes of Pong boxes to a tiny, niche market to creating graphic-intensive productions that rival the income of Hollywood's box office, the video game industry has boomed in a very short period of time. Find out how agile methods helped one video game studio make the transition. There comes a time in every software professional's career when telling the truth to someone in power becomes an issue. It can be a difficult situation, but it's far worse to keep silent. Norm Kerth offers some helpful advice on speaking up in ways that are tactful and sincere. If you've run through the standard design approaches and still need that killer test case, try mind maps. An overwhelmingly harsh test will expose dramatic vulnerabilities, but stress testing requires sensitivity to the unexpected. 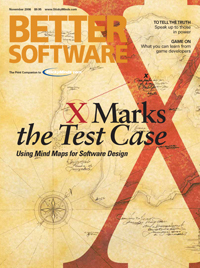 In this article, Michael Bolton directs readers out of the automated-testing comfort zone and toward better methods of spotting unanticipated problems. A look back at the life of Bill Elmendorf.